↑ Hsiung, Deh-Ta; Simonds, Nina (2005). Food of China. Murdoch Books. পৃষ্ঠা. 239. http://books.google.co.uk/books?id=-9XWQrpbLAgC&pg=PA239&dq=#v=onepage&q&f=false. ↑ Cho, Lily (2010). Eating Chinese. University of Toronto Press. পৃষ্ঠা. 51. http://books.google.co.uk/books?id=t024cSJL--YC&pg=PT51&dq=#v=onepage&q&f=false. ↑ Aggarwal, Uma (2013). America's Favorite Recipes. iUniverse. পৃষ্ঠা. 199. http://books.google.co.uk/books?id=Hd_uAQAAQBAJ&pg=PA199&dq=#v=onepage&q&f=false. ↑ Mason, Laura (2004). Food Culture in Great Britain. Greenwood Publishing Group. পৃষ্ঠা. 163. http://books.google.co.uk/books?id=9rFIyN1OWfQC&pg=PA163&dq=#v=onepage&q&f=false. ↑ Bindloss, Joseph (2010). Nepal: Country Guide Series, Lonely Planet guidebooks. Lonely Planet. পৃষ্ঠা. 65. ISBN 9781742203614. https://books.google.com/books?id=wiIw2_WFwC4C&pg=PA65&lpg=PA65&dq=chow+mein+nepali#v=onepage&q=chow%20mein%20nepali&f=false. ↑ Ahuja, Aashna (2015-11-27). "Indian Chinese Cuisine: India's Love Affair with Chinese Food". http://food.ndtv.com/food-drinks/indian-chinese-cuisine-indias-love-affair-with-chinese-food-1214445. ↑ Sakauye, Russell (2013-05-29). "The Legacy of the Cumberland Chow Mein". The Bulletin (JCCA) (Japanese Canadian Citizens Association). http://jccabulletin-geppo.ca/national-feature/the-legacy-of-the-cumberland-chow-mein/. ↑ Bain, Jennifer (2011-03-08). "Japanese-Canadian chow mein: Chow mein — with seaweed and pickled ginger — never tasted so good". Toronto Star. http://www.thestar.com/life/food_wine/recipes/2011/03/08/japanesecanadian_chow_mein.html. ↑ "Recipe: Egg Chowmein". 2013-01-21. http://zeenews.india.com/entertainment/gourmet/recipe/recipe-egg-chowmein_2390.htm. ↑ Shaw, Kanchan (2010-03-17). 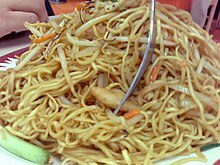 "Egg Hakka Chowmein". http://www.gourmetindia.com/topic/1253-egg-hakka-chowmein/. ↑ Bhattacharya, Chandrima S. (June 21, 2015). "Long live chow mein: Hakka or gravy, Dacres Lane or Tangra, Chandrima S. Bhattacharya traces the journey of the ubiquitous Calcutta chowmin". Calcutta Telegraph. http://www.telegraphindia.com/1150621/jsp/calcutta/story_26925.jsp#.VcaYLbXCV7k. ↑ "Lunch Bunch: A Peruvian twist; Andes fare meets Mexican eatery". Times Record News. 2012-07-06. http://www.timesrecordnews.com/news/2012/jul/06/lunch_bunch/.